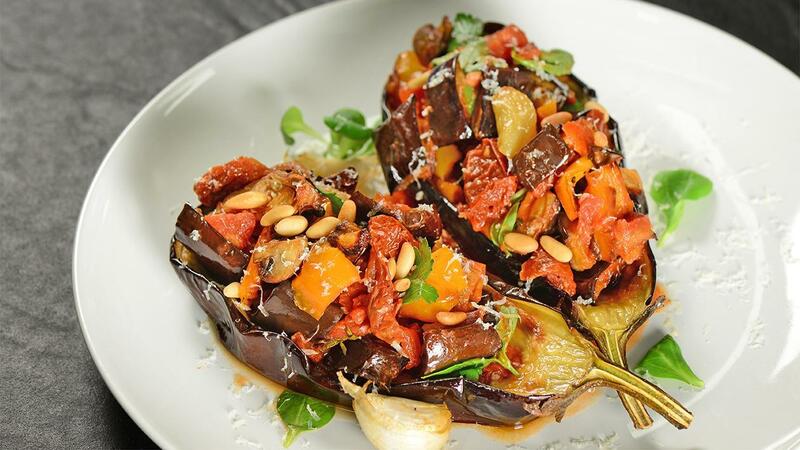 Caponata is a delicious Sicilian eggplant salad with caramelized eggplant, crisp celery and a savory sweet and sour flavor from the tomatoes and vinegar. Serve it as an antipasto with bread, or as a relish for fish and meat dishes. Check out the full recipe below. Sauté pine nuts in halve the olive oil until golden brown, place on kitchen towel to remove excess oil. In the same oil start by frying off the onions, eggplant and capsicum until golden brown. After few minutes add the olives, celery and capers. Only cook until soft. Add in sundried tomato pesto and cook for 1 minute to release flavours, then add Knorr Italian Tomato Base and cook for 5 minutes to allow flavours to come together. Season with black pepper and garnish with pine nuts. Serve with ravioli’s or bruschetta. For the eggplant, I prefer using small eggplants such as Italian, Graffiti, or Japanese because they tend to have less seeds than your average Globe eggplant.